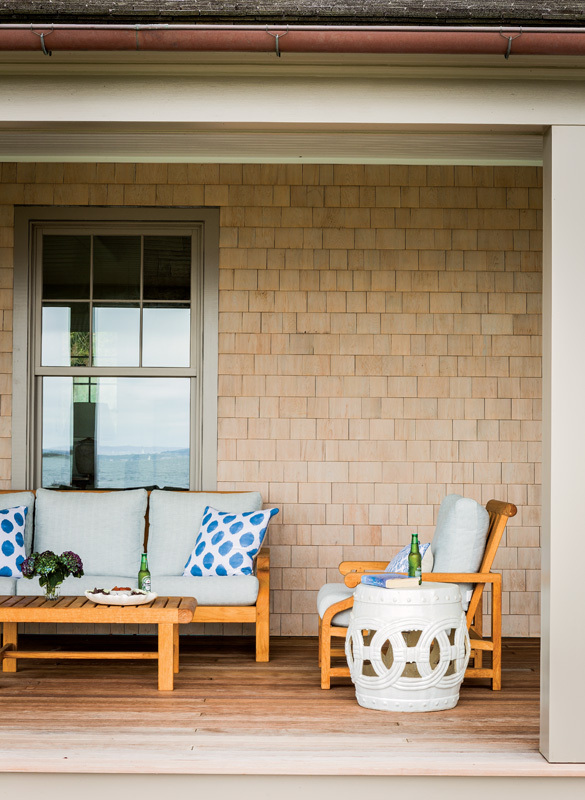 Architect Jacob Albert and interior designer Dorsey Miller collaborate to create the perfect New England vacation house. The weathered antique console table mimics the raw quality of the natural stone fireplace in the living room. 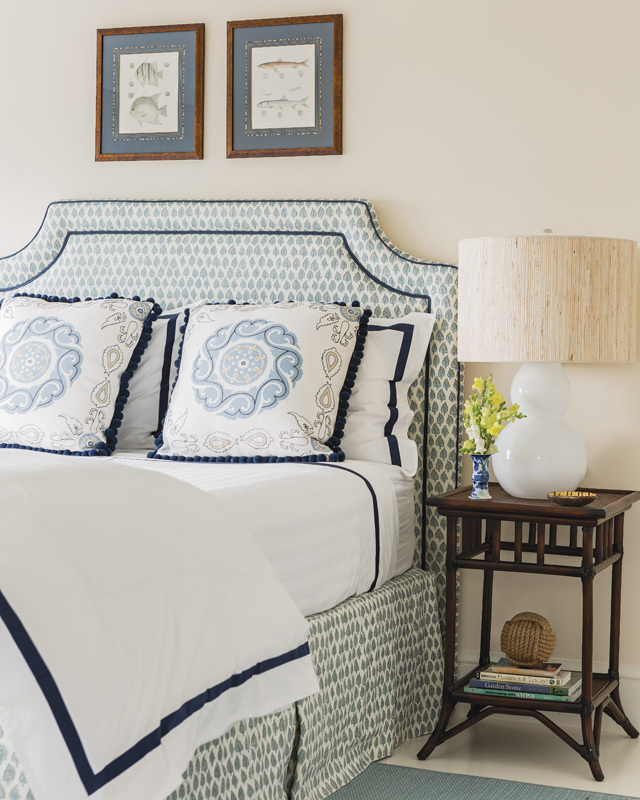 "I’m a new traditionalist, or, neo-traditional,” laughs Boston interior designer Dorsey Miller. “I use pattern and color, but make it a little fresher. 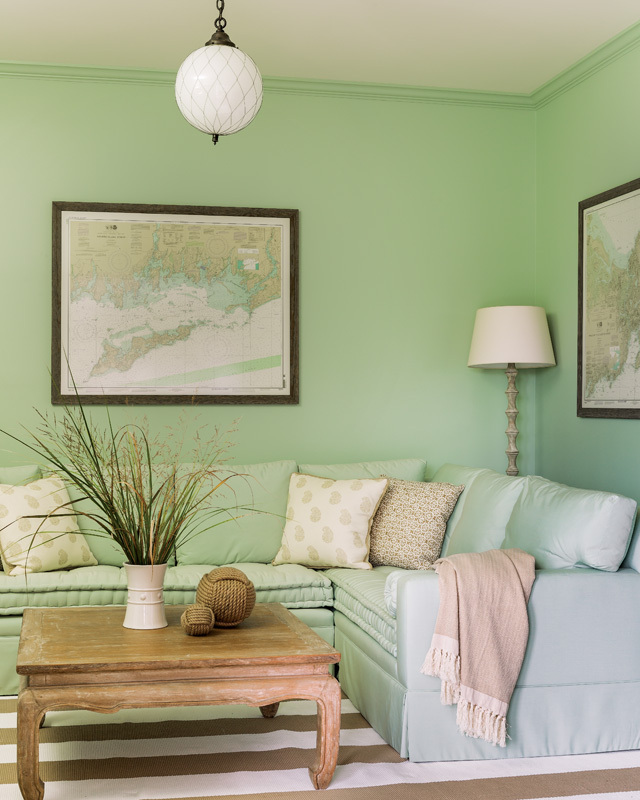 And I always look to nature for inspiration.” A case in point is the sea-centric décor she created for a family vacation house on Fishers Island, off the Connecticut coast. 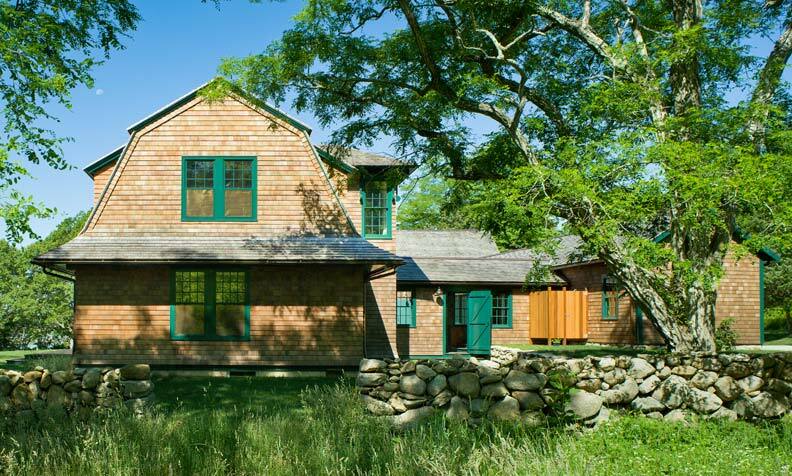 For their new traditional house, the homeowners turned to architect Jacob Albert of Boston’s Albert, Righter & Tittmann. The result is a gambrel-roofed beauty in the Shingle Revival style beloved by today’s Northeastern waterfront homeowners. Measuring just under 5,000 square feet, the H-shaped structure overlooks the harbor. 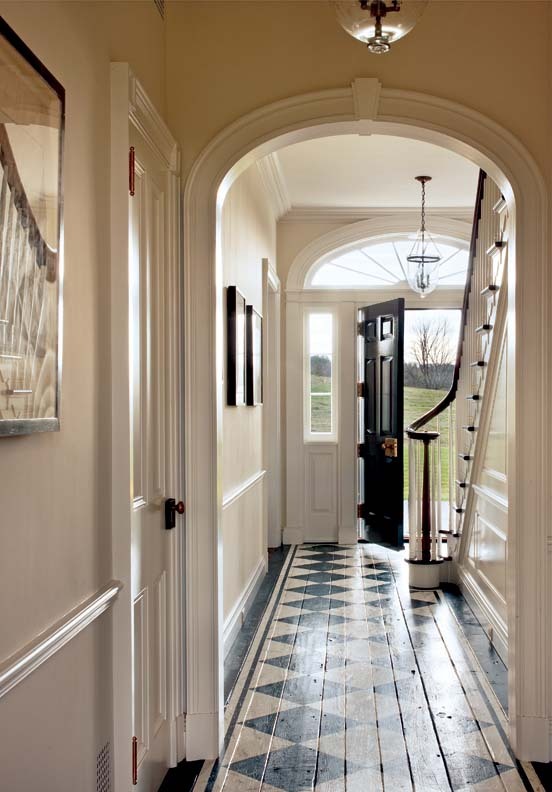 The front entrance is classic New England design. The design was driven by the owners’ desire to have enough bedrooms so that all the children and grandchildren could visit at once. They wanted central gathering spaces and bedroom wings that provided privacy. His design places the kitchen, living room, and dining room in the center of the H, all fronted by a broad porch. Two bedrooms are located on the second story of this central block; five additional bedrooms and a family room occupy the wings. The designer purposely dressed up the dining area to offset the casual open concept of the main multi-functional room. Miller’s design scheme draws on the informal spirit of a summer house and the watery surrounding hues: soft greens, blues, sand tones, bleached whites, and the saturated marine blue of the ocean on a windy day. At the center of the house, a granite fireplace wall dominates the living room. Here Miller created a conversation grouping with two white sofas and a pair of bergeres upholstered in sunny printed fabric. With a serene white background and a sisal rug, the warm stone hues are echoed in the wide plank flooring. Teak counters and Sister Parish wallpaper add warmth to the pantry. The kitchen makes a stylistic statement with simple white paneled cabinets, beaded board, bin pulls, blue and white textiles and honed white marble countertops. A home chef’s delight with stainless steel appliances, the kitchen is augmented by a butler’s pantry. Its white cabinetry has glass doors above, while the lower cabinets are topped with a teak counter. 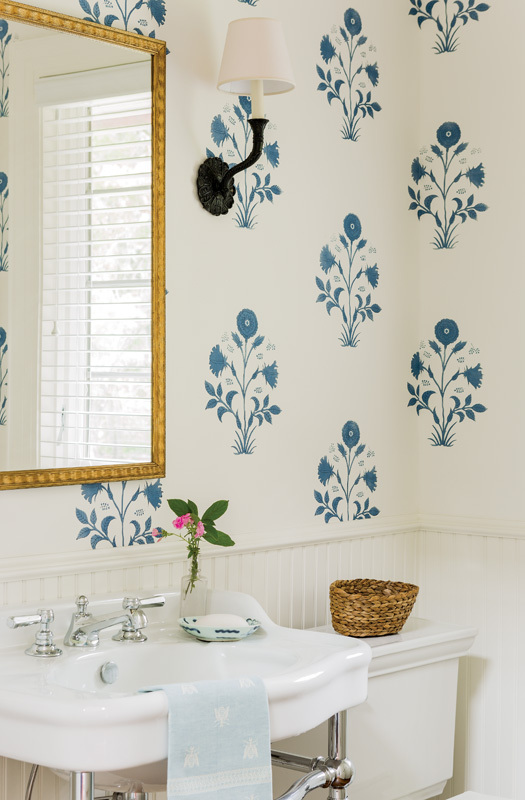 A white porcelain apron sink is a practical element, whereas playful Sister Parish wallpaper brightens the wall. The screened-in portion of the porch is where many summer nights are spent chatting around the fire. It is also close to the garden, so you can wash fruits and veggies when they first come into the house.” Between the pantry and the exterior is a cubby-lined mudroom. The bedrooms are kept simple with built-in storage. “They have everything you need, and nothing more,” Miller says. “Simple and casual, they are not very big. No one spends time there during the days, so we concentrated on making the public spaces bigger.” She points out that each bedroom does have an en suite bath. The square footage of the house was constrained by a tight lot and the municipality’s required setbacks. Also, part of the homeowners’ plan was to build a barn that stores boats, kayaks and beach gear in the winter and acts as a site for parties in the summer. It occupies a corner of the lot. “This room is so pretty and so functional,” Miller says. “There’s another fridge in there, as well as a drinks fridge. 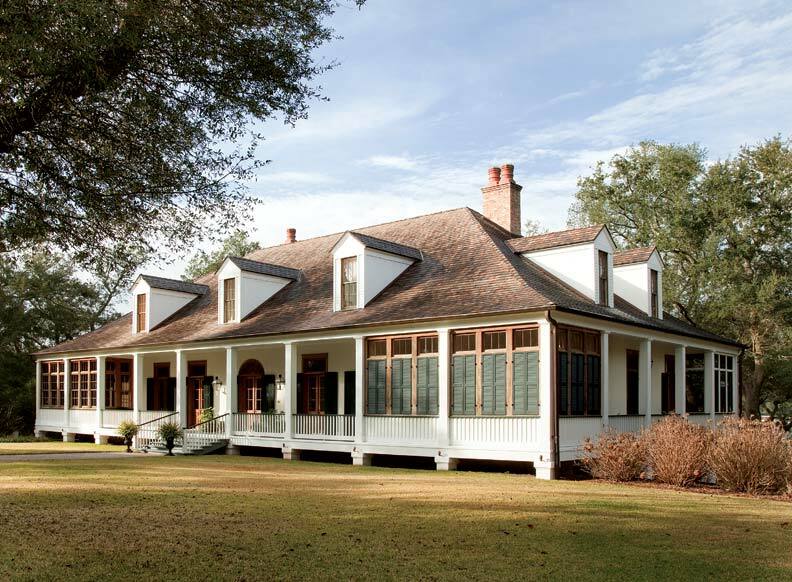 Cooper Johnson Smith Architects designs a breathtaking French Colonial house in Pensacola, Florida, inspired by the past.